Is it possible to ave my own template? Welcome aboard! Thanks for your inquiry. Yes: as a Goalscape Online Unlimited subscriber, you can create an unlimited number of projects of unlimited size and share them with anyone else – and you can even give Free users Edit access to shared projects (1 per Free user). To create a project template, build a generic version of your project then Download it as a .gsp file using the 'down from the cloud' button at the top of the screen (see attached screenshot). In the Save As window, rename the file to include the word 'template' (you can also include a datestamp in the filename). 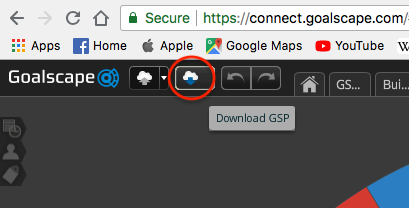 Then to use that template to create a new instance of your project, Upload the .gsp using the 'up into the cloud' button. Remember to change the name of the Main Goal at the centre straight away to avoid confusing this new instance with the original version (hint: insert your new text at the start of the name – then the tab label will show the difference). You can of course repeat the Upload and Rename process as many times as you like: each time you do so, you will create a new instance of the project. Many consultants in different fields do this to create custom projects for their clients. They use the client's name in the first part of the Main Goal name to enable easy differentiation. They can Share each customized version with multiple people in each client organization, giving them all Edit access to that project – even as Free users. This provides exceptional added value for their clients, at no additional cost. May you achieve great goals! Your latest message arrived here with no content (see your discussion). If you are replying to the notification emails, please note that text must be entered 'above the line' – ie right at the top of the Reply field. If you want to include previous text and 'in-line' responses, you will need to C&P the relevant text at the top of the Reply field. Or you could post direct on your discussion (you are a Watcher here under both the email addresses you have been using to post). If you need help with Goalscape please start a new discussion. A conversation has been started with the Goalscape staff to resolve this discussion. This discussion is private. Only Goalscape support staff and members of Goalscape Software can see and reply to it.